a cappella behind the scenes: The Festival awaits! 隆重登場! The Hong Kong 2012 International a cappella Festival is here! 每一年的無伴奏合唱節都會吸引一眾樂迷熱烈討論，皆因國際級a cappella巨星都會因這個盛事而來港獻技！繼The Real Group和The Swingle Singers後，今年主辦單位繼續請到相當有份量的大師級人馬﹣來自美國的全男班組合Rockapella! Rockapella可謂無伴奏樂壇的「長青樹」，皆因他們於1986年組成，擁有超過20年的歷史，今趟來港演出必定會為整個合唱節生色不少! 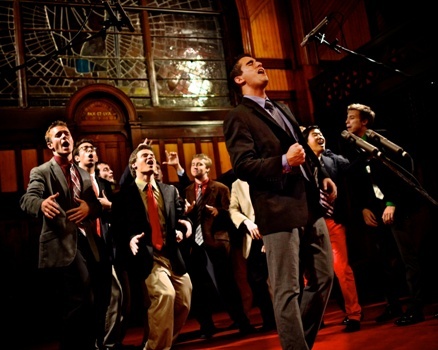 We are excited to invite American a cappella talent for this year's Festival. Following the phenomenal teams of the past two years (The Real Group and The Swingle Singers) is the acclaimed American all-male group Rockapella! They have been around for more than twenty years, and are sure to blow us away in their 2012 a cappella Master Series concert. We are very happy to invite young American a cappella talent for this year's Festival. In March, you will be able to see the Tufts Beelzebubs (in addition to being a finalist in the NBC a cappella competition 'The Sing-Off', they have also been recorded as the voice of The Warblers in the hit TV show 'Glee') as well as Delilah (Season Three of 'The Sing-Off'... welcome back, Amy and Laina!) performing in the 2012 International a cappella Extravaganza, which also features the popular artist Kay Tse, our a cappella Festival Ambassador. What's more, we will have not one but TWO free outdoor a cappella concerts in the Hong Kong Cultural Centre Piazza! With so much happening this year, get ready for a phenomenal Festival! 「Awesome Inc.」主題. 主題圖片由 rami_ba 提供. 由 Blogger 提供.